There were six brothers in the family, one sadly dying in infancy, five growing up to be entertainers of some kind, the best known three of whom would grace the silver screens for the best part of two decades. 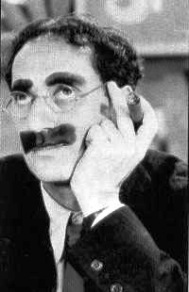 While their real names have somewhat faded into history, Groucho, Chico (pronounced CHICK-O) and Harpo, as they were known to the world, have far from disappeared as television networks round the world still show their films with some regularity. Harpo was the clown of the three, and continuing the then recently lapsed traditions of silent movies to appease large parts of audiences reluctant to adapt to films with scripts (seems amazing to us now) did not speak at all during any of the films, expressing himself instead through exaggerated actions which probably have lost their appeal today, but which were central to the plot of the films when they were released. Harpo was arguably the best actor of the three, his character and part in the plot coming across through his expressions and body language. But like his brother Chico he was also a very accomplished musician whose harp playing not only got him his name literally but also metaphorically, as his musicianship was a central part of almost every film.